With Dads passing we went back to San Jose and Bob got a job in Gilroy building a new stretch of highway. 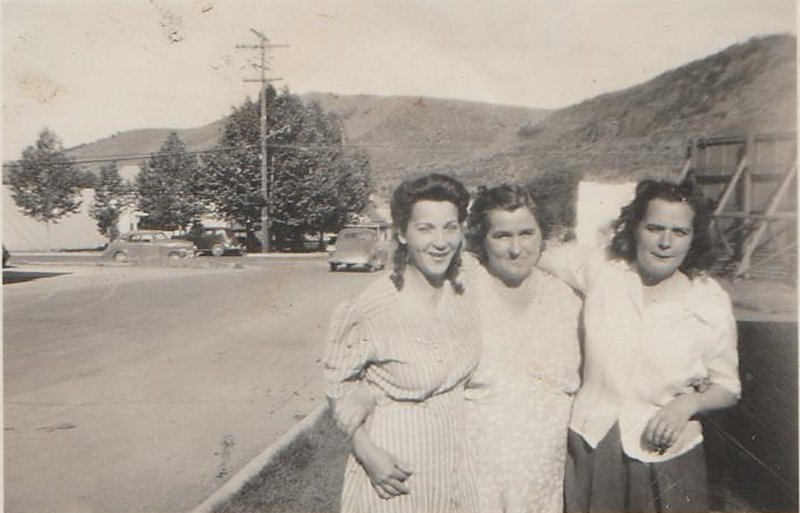 We found an apartment, Bob taking me and the baby to meet his Aunt Ellen and Mamie Goodrich and her daughter. Aunt Ellen was in her late eighties, the first words she said on meeting me was “are you catholic?” I said no, then she invited us into her house on the original Willson homestead. We took her to see her sisters, Bob’s other aunts and suddenly she would disappear from sight and when we looked for her she would be sitting in the car ready to go. We meant the Dexter’s, Whites and Kincade’s. They didn’t make us feel welcome, they were small town ranchers who thought they were better than anyone else. We looked up Bob’s mother side of the family, the McLaughlin’s at the mission in San Juan Baptiste. We meant Mrs. Ladd who had worked for Grandpa McLaughlin. She was a friend of Bob’s mother Kate. She told us William, Bob’s father, couldn’t marry Kate until Dorson died because Kate was Irish and Catholic. Grampa McLaughlin had a large ranch between Hollister and San Juan Baptiste. He grew potatoes, oats and raised Morgan Horses, the finest Morgan Horses in the state. She said he went to church every Sunday at the mission, but never made it past the bar on the way home. She showed us where James McLaughlin was buried in the veteran’s cemetery at San Juan, he was a World War I veteran. The records at the mission showed Kate was born Mary Katherine in 1884. When Bob’s mother died so many died at the same time because of the flu epidemic, she was buried in an unmarked grave with others in San Jose. His father lived till 1932 but Bob never saw him but once since he was taken by the Peduzzi’s to Oakland and that was when he was six years old. William and Kate had seven living children, the Willson family would not take any of them because Kate had them all baptized Catholic and because they were also Irish. They were a snobbish group of puritans and masons who thought they were better than anyone else. The girls, Bob’s sisters Gertrude, Gracie Mae, Evelyn, Loretta were placed in the convent at Santa Cruz. The three oldest were going to Catholic school in Gilroy. Bob and Joe were placed with Mexican families, Joe’s name was William Joseph, the Novices’ called him Joe and Bob was placed with the Peduzzi’s when he was just two. I don’t understand why William couldn’t keep his family tighter. Grace said it was because Evelyn told Aunt Ellen he put his hand where they shouldn’t be. Albert the oldest was put in a unknown mental institution. He had a very high fever when he was about five and afterwards he remained a five year old. We never knew what happened to Gertrude after she left the convent at the age of sixteen. Bob never received any affection from the Peduzzi’s. He was just a meal ticket especially during the depression as Mrs. Peduzzi’s received state money for his care until he was 16. 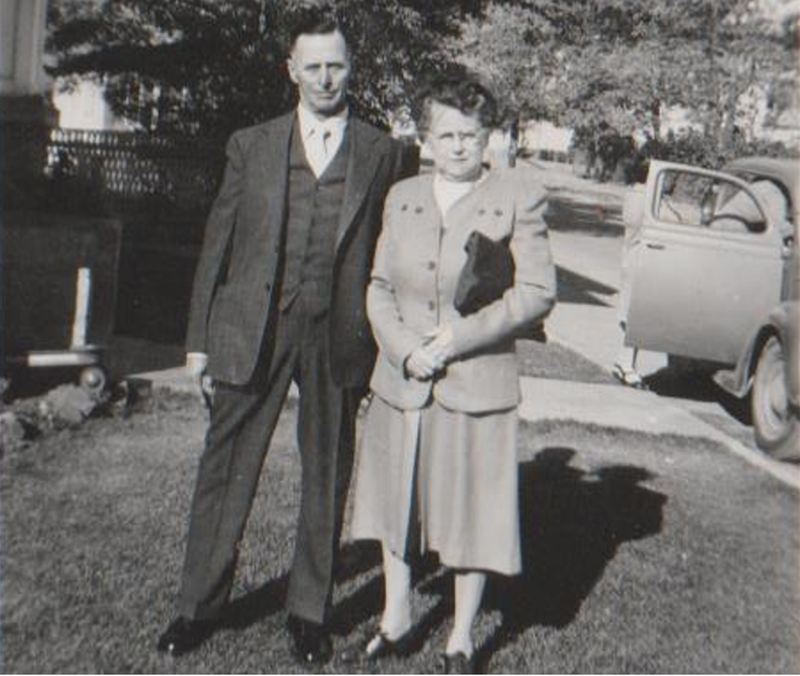 From the time he was 10 he delivered newspapers giving his money to Mrs. Peduzzi. He won a bike and started delivering telegrams in the Berkeley Hills at the age of 12, still giving to Mrs. Peduzzi. When he came home on his 16th birthday he found an old suitcase with his few possessions, two shirts, a change of underwear and a pair of jeans. The state no longer paid for his care. There was never any care, no love, no Christmas gifts, no birthday parties’ he said the only one that had kind word was Helen the youngest Peduzzi daughter and the oldest daughters husband Mike Julian. He quit school and started delivering telegrams full time, renting a dump of a room for a dollar a day. He bought a old model T for $10 and Mike Julian helped him fix it up. At that time he meant Vernon and Stanley Schultz, they would take him home with them, their mother treated him great, making sure his clothes were clean and mended and see to it that he had plenty to eat. The car he bought was his greatest joy. Bob, Stanley and Augie, another close friend started south to Baja California and then on to Tucson Arizona. A Jewish boy joined them leaving Mexico and from then on they ate pretty good, Bob said they would have starved to death if it wasn’t for him. He could always get food at a Jewish owned store. He never ever got to Tucson, but the name became his nickname. We were in our apartment in Gilroy about six months when the job ended. We went back to San Jose, getting a motel room with a kitchen, you had to use a quarter for gas to cook by and electric to see by. 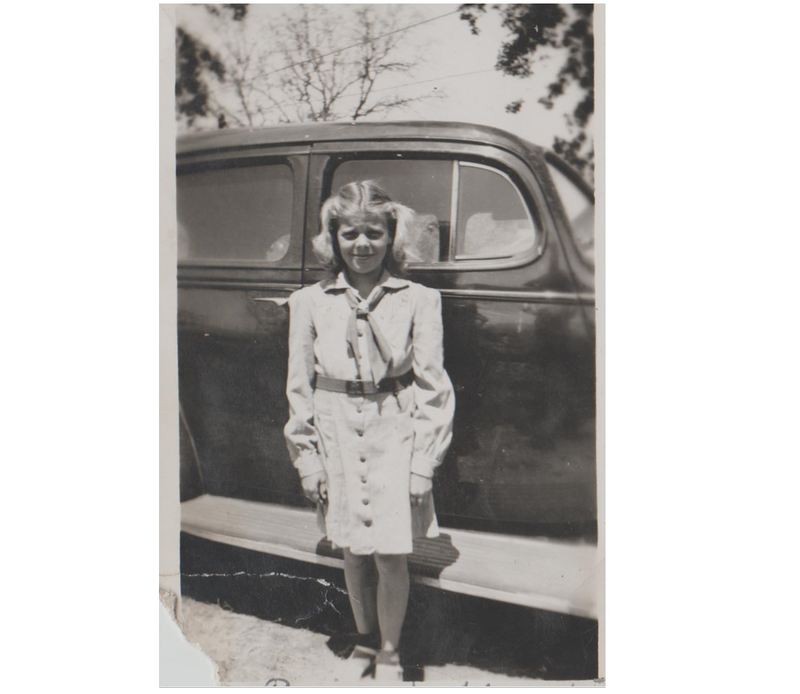 Grace brought Bob’s sister Evelyn over to stay with us, her husband Kelly Edwards wouldn’t find Bob a job as long as there were San Jose teamsters out of work, he was now head of the teamster’s local union. Poor Evelyn, she was very upset having lost her denture plate someplace. She would cry at the least little thing, complain constantly if anything disturbed her. No work, Bob wanting to go to Oakland and transfer his teamster union card to their union. We did take Evelyn with us, the only place we could afford was a one room motel with kitchen next to Castlemont High School. Evelyn did nothing to help, she was scared of the baby Mike. Ann Schultz found her a couple of jobs but she would not take them. Pickings were slim, Bob tried his best, he transferred to the Oakland Union and with his first job and pay check I insisted Evelyn be sent back to Graces. Grace said she arrived but lost her suitcase so Grace gave her some money to go to Mamie Goodrich’s. That was the last time anyone seen or heard from her, I really felt sorry for her but didn’t have the patience to deal with her crying and nervousness. My sister Alice and Charley came to live with us, she never offered to help with the rent or the work and later we were told to move because there were too many people living in the apartment. Charley finding work in the shipyards in San Francisco so they moved to San Francisco into a house that some Japanese who were put in a internment camp once owned. We rented a two bedroom, 5 room house with an attached garage in a new subdivision next to San Leandro Creek in San Leandro. Bob rode to work with several real nice neighbors, and when Katy was born in July 1943 our neighbor Mrs. Dutton took me to the hospital and called Bob. Katy came fast and easy at the Oakland & East Oakland Hospital. I again breast fed, Katy and another baby whose mother’s milk hadn’t come in. I got milk fever and when I went home was running a 105 temperature. Bob sent for mother and I think that was the only time that mother was angry with Bob. Mother stayed till I managed on my own. Bob being raised by Spanish/Italians and was taught that housework was a women’s job, men didn’t do housework or watch children. I gave Bob his first every birthday party in March 1944. All the fellows he went to work with and their wives came plus the neighbors, one drunk fun mess, Nancy being the results. In June Bob received his draft notice to appear July 1st in Yreka. We tried to sell our furniture but gave away most of it. On the 28th of June we caught a train to Dunsmuir where Barney meant us. 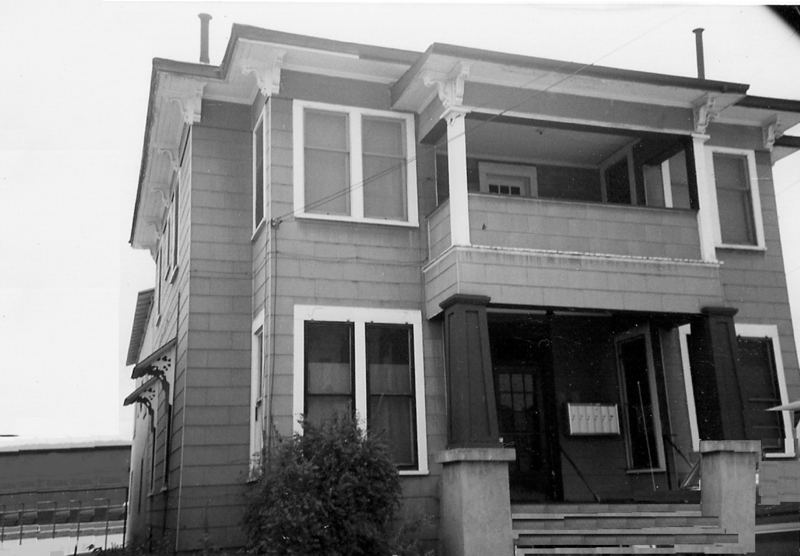 My Brother Pete had empty an apartment next to Mothers in the Apartment House dad had made from the old parsonage. It was furnished, charging me $35 a month plus electric and oil for the stove. It consisted of a bedroom, front room kitchen, bath, and had 12 ft. ceilings. He said he would knock off $10 from the normal rent of $35 if I kept the yard and halls clean. We took it but I was floored to find out my mother had to work at the laundry in order to pay her her son rent and utilities. From the first of the war everything was rationed, gas, food, meat, even shoes. 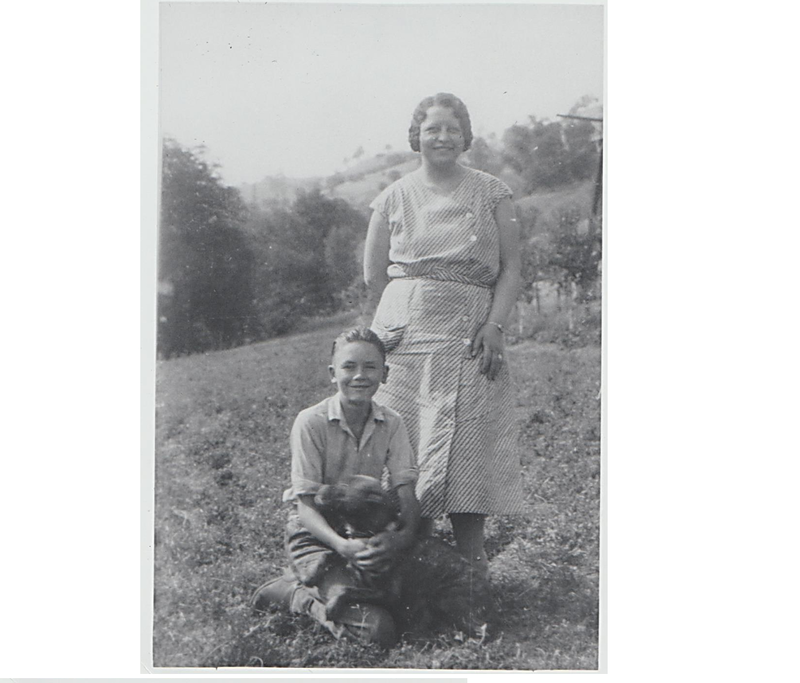 Mother was working, Harry had bought a house by the rail depot, he died shortly after dad. He left the house to mother and she sold it for enough that she could visit us and her aunts as Pete would have never given her enough money to travel.. When Dad died Pete sold the big house to pay all Dads bills. He also sold the house Dad had built along the side of the Old Perkins place. He gave me and Alice $500 each and sold the old Perkins place to Della for $1500. Generous of him, as he kept the other six houses and the apartment house and sold the lot next door for a post office. He went to Crescent City to work just after the war but only for a couple of months coming back and getting elected city councilman and water commissioner. My brother Sam had his try at the Richmond shipyard, he bought a house in Albany and was there for about nine months then went back to Etna. It’s hard to be a little fish in a big pond after years of being a big fish in a little pond. One thing that would really make mad was to see the farm boys not in the service when they drafted Bob from a defense job. Bob went into the service in August and I was expecting Nancy in November. The pay Uncle Sam payed me was $82 a month to live on. Bob took basic at Fort Ord and then was sent to Fort Riley Kansas to a Tank Unit. 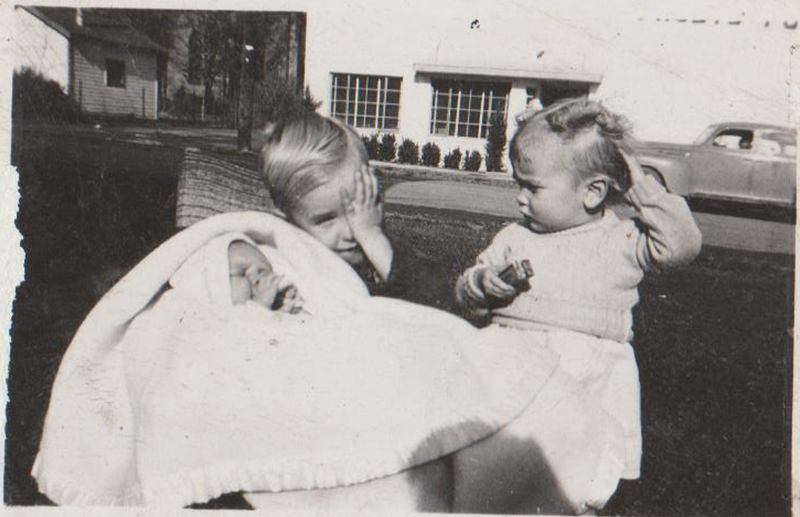 Nancy was born on November 2, 1944 and again I had so much milk, I nursed a little boy whose mother had died. Guess what, I got milk fever again, then they had to put the little boy on goats milk. I was very sick and could not walk from the 20th of November till two days before Christmas. 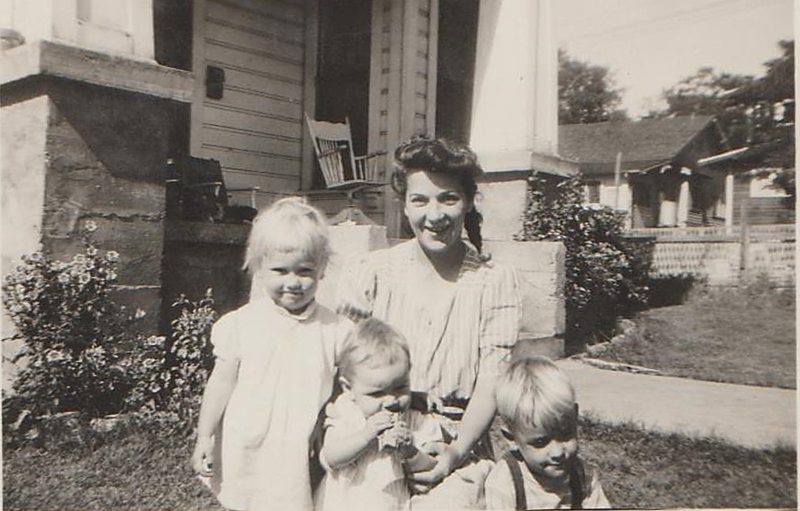 Della took Nancy, Bernice took Mike and Mother who had just married Marvin Wisner in October took Katy and I. I laid on mothers couch and made stuffed animals for punch boards at the Walker Store and Bar, so I could buy the children Christmas. We had Christmas with Della’s family. New Year’s Eve Bob was in a terrible train wreck just outside of the Salt Lake in Utah. He had gotten off at Salt Lake to buy a beer and when he go back on his seat was taken. The Porter found him a seat in a car in back of the one he had been sitting in. It was a steel car, the other was a wooden one. A train ran into the back of the one he was riding in with such force that it pushed his car through the one in front of his. When he go out to see the wreck he saw all his buddies that had been traveling with from Fort Riley having been pushed up against the windows, all dead. They gave him a day delay in travel time and was able to visit us and see Nancy for the first time. After what he had gone through I always knew he would come safe. He shipped out of Seattle to Hawaii for jungle training, then on to Saipan where he first saw action. From Saipan he was part of the initial landing on Okinawa. That winter it was very cold most of the time, just above 0 degrees, even the sewer froze. The diapers would freeze as I hung them on the line. Mother and Marvin went to Dixon to work on a farm, my niece Peggy came to live with me, until she came the picking were pretty slim. 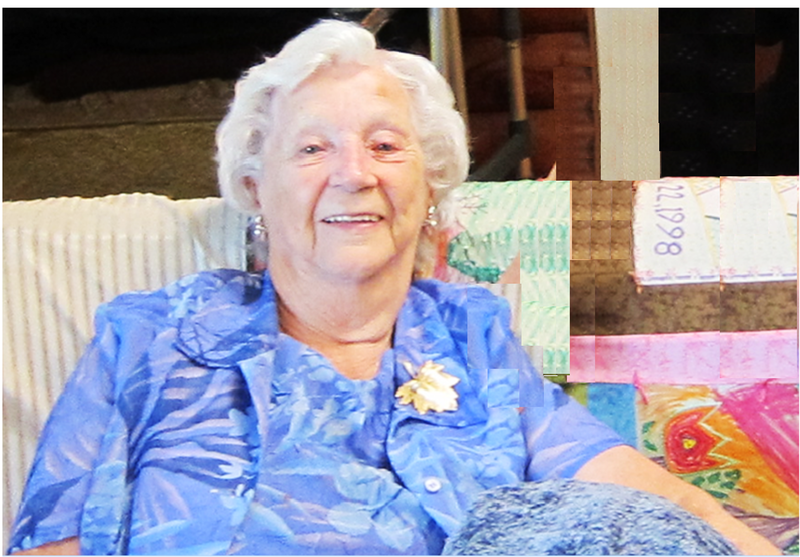 She worked at Foster Freeze and the ranchers would give her meat, cheese and butter. I traded my meat stamps for shoe stamps as Katy and Mike were out growing theirs real fast. I wrote Bob every day, mostly V-mail which was free. 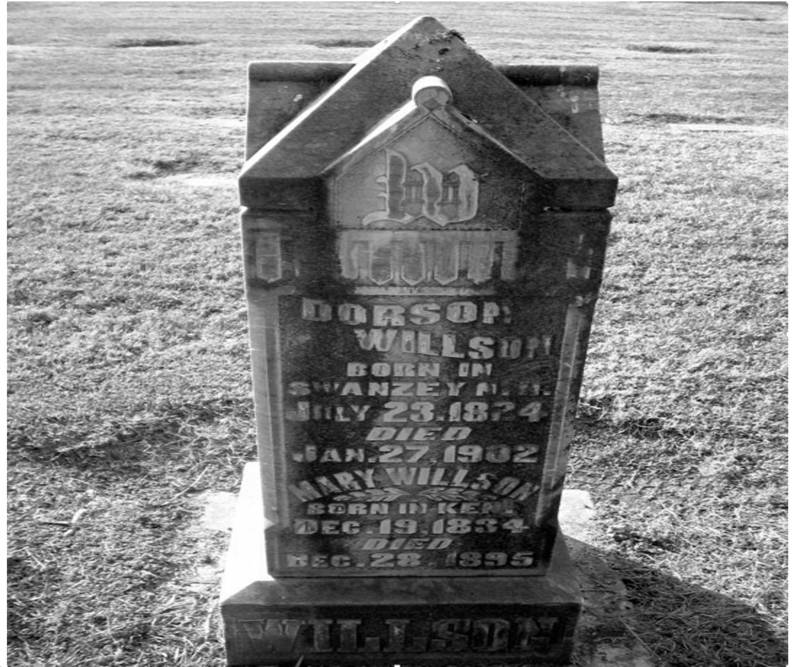 Elna Dawson was working in the mill at Weed and she would come up once a month and we would go to a show and celebrate a little, Peg watched the kids. That year we watched as a Jap balloon with bombs flew over Yreka, it finally came down on Humbug Mountain starting a fire. The Japanese had sent them over the USA and Canada on the trade winds, one killing a little girl in Oregon. That same year I had the children baptized Catholic for Bob. Judge Allen and Kate Mathews were God Parents. Kate had moved into mother apartment, she was mother’s nurse when I was born. Della though I was the meanest mother ever because of two offenses. 1. I made Katy, when she was only one year’s old crawl into the bathroom when she had to potty. I was too big and pregnant with Nancy to carry her and she was potty trained by 15 months. 2. I burned Mike’s fingers for playing with matches. He would go out where we kept the oil barrels and light matches. I tried everything to stop him, talking, spanking, yelling, nothing worked until I burnt his fingers. Thank heaven for Pearl and her brothers. The Westbrook’s lived in the upstairs apartment, their Dad was a prison guard and Pearl would watch and play with Katy and Mike. In the other apartment live the manager of our local grocery store. He lived with his sister and kept me in grocery that were about to go off the shelf. 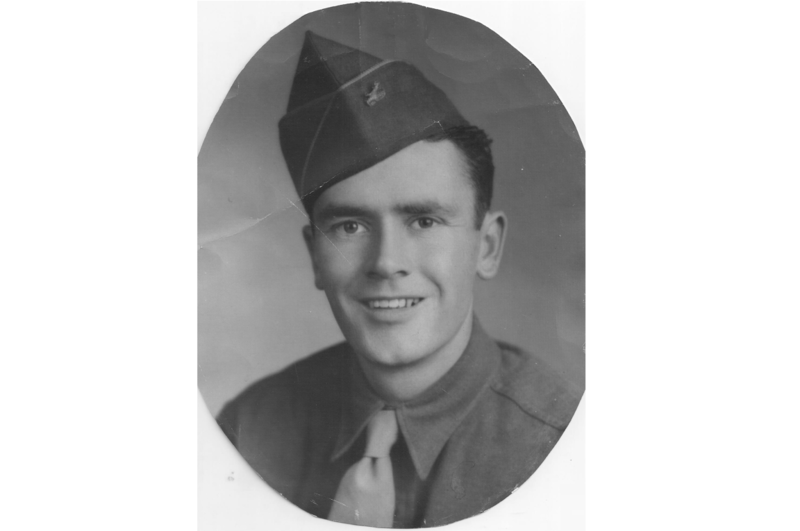 The day Germany surrendered and the European war was over, Alvie was home on leave from a malaria attack, he brought frog legs for us to eat, and they tasted like chicken. When Bob went overseas I got $29 more which I saved each month. One of few smart things I did, that and not touching the $500 Pete gave me when Dad died. On Okinawa the Japs had all the Tanks zeroed in so we couldn’t use them. They used our our Red Cross signs on our ambulance for target practice, needless to say they were short of drivers. They took a look through the records and found out that Bob had driven ambulance and had medical training, he was transferred to the Medical Corp. He brought General Buckner’s off the battlefield when he was killed by artillery fire. We got very few letters, but mentioned he got dysentery, jungle-rot, even got stuck trying to get in a to small cave during a artillery barrage. He was prepared for the invasion of Japan, but Japan surrendered and he was sent to Korea with the army of occupation. With the war over Bob came home Christmas Eve, the girls were afraid of him, but Mike was one happy boy. This entry was posted on July 27, 2014 at 1:59 pm and is filed under Uncategorized. You can follow any responses to this entry through the RSS 2.0 feed. You can leave a response, or trackback from your own site.